Brake master cylinder holder "2"
Install the brake master cylinder holder with the arrow mark "a" pointing forward. 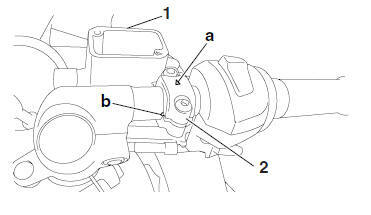 Align the end of the brake master cylinder holder with the punch mark "b" on the handlebar. First, tighten the front bolt, then the rear bolt. 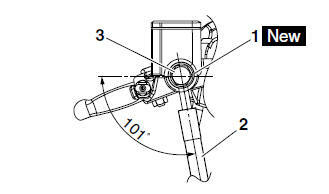 Brake hose union bolt "3"
Install the brake hose at an 101 angle to the front brake master cylinder as shown in the illustration. While holding the brake hose, tighten the brake hose union bolt as shown. Turn the handlebar to the left and right to make sure the brake hose does not touch other parts (e.g., wire harness, cables, leads). Correct if necessary. Before fully installing the front brake light switch, be sure to completely install the rubber cover over the switch. Also, be sure not to twist the front brake light switch lead when screwing in the switch. Brake fluid level Below the minimum level mark "a" →Add the recommended brake fluid to the proper level.